The cornet is a brass instrument very similar to the trumpet, distinguished by its conical bore, compact shape, and mellower tone quality. The cornet was originally derived from the post horn around 1820 in France. Cornets first appeared as separate instrumental parts in 19th century French compositions. Janella started playing the cornet at the age of 8 for Swinton and district Excelsior band. She soon moved onto solo cornet and by age 11 was playing the soprano cornet. Janella entered the Ryedale solo competition in 1987 and won the 11-13 age group. In 1999 Janella looked for a new challenge and the opportunity to join Stape Silver Band arose. In April 1999 Janella played her last contest for Swinton and first for Stape, competing for both bands in the Yorkshire and Humberside Brass Band Association grading contest. She won with both bands. Swinton won the third section and Stape the second section. In 2003 Stape came 2nd at the regional finals and competed in the national finals in Dundee, also in this year she went on tour with Stape to Belgium. Janella left Stape in 2006 due to work commitments. In 2010 Janella joined Malton white star band on soprano before taking a year out to start a family, she returned late 2011 as principal cornet. In August 2015 Janella joined Simply Brass and in January 2016 joined Driffield Band. Janella left Driffield at the end of 2016 to focus on spending time with her son. She left Malton White Star In May 2018 and rejoined Driffield in July 2018 as principal cornet. Luke started playing in 2008. Since then he has played with the East Riding Youth Brass Band, taking on the Principal cornet seat in the senior section in 2015. In 2018 Luke stepped down from the Principal seat of the youth band to give another player the opportunity to play that role. At the present time Luke is having a go at playing the Soprano Cornet. He joined Driffield Silver Band in January 2013 on 3rd cornet, and has been promoted to lead the 2nd cornets from Feb 2014. His progress continued in July 2016 as he again stepped up to take on the Repiano Cornet chair. Due to the resignation of our Principal Cornet Janella in January 2017, It was decided that Luke has improved so much that he be invited to sit on as Acting Principal Cornet. Congratulations on your appointment Luke!! March 2018 Luke stepped down as Principal Cornet to let his mentor Richard to regain his position as Principal. Additionally, Luke played Principal at Bridlington Excelsior Band upto June 2017 and now has joined Graham Walkers Hunmanby Silver Band, playing 2nd man on the front row. Wendy started playing piano at 8 and trumpet at14. She did music as a second subject at PE college. She went into teaching where she picked up the basics on many instruments. Her trumpet playing was non-existent for 20 years whilst raising her family and concentrating on other activities. In 1995,she joined brass bands for the first time so took up the cornet but has played all brass instruments along the way. When she retired she moved to Bridlington and now plays for Hunmanby Silver Band and Bridlington Excelsior. 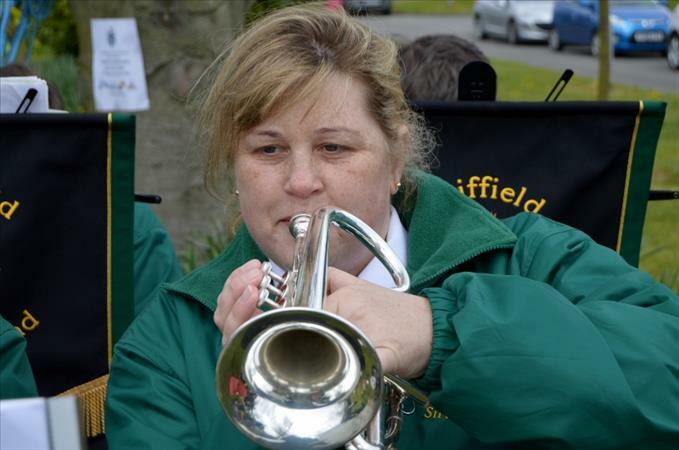 Wendy joined Driffield in 2006, and has played through out the cornet section. She has settled on Repiano cornet and now leads the back row with authority. February 2018 Wendy joined the Solo Cornets on the front row. 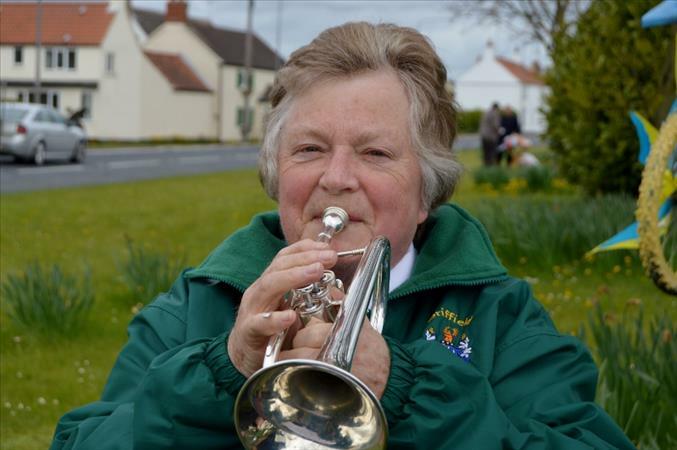 Jo-Anne started to play the bugle at the age of 12 with the St Marys Church Lads & Church Girls Brigade in Beverley. Within a few weeks Jo-Anne was given a Trumpet & from then on she has never looked back. In 1979 Jo-Anne auditioned for the Church Lads & Church Girls Brigade National Band, where she was given a seat on the front row. After a couple of years playing for both bands, Jo-Anne became the Principal Cornet of them both, firmly cementing her position within the organisations with an association that lasted over 25 years. work hard within her bands, this hard work paid off as it culminated with her becoming the Brass & Woodwind Section Leader of the National Band until she left due to family commitments in 2002. Jo-Anne who is married to our Assistant Principal Cornet Richard, joined DSB for a brief spell a couple of years ago. This unfortunately was brought to an abrupt end due to Jo suffering with recalcitrant migraines. We are pleased to say that these are now under control & we are very happy to welcome her back to DSB! !